Space Center located in Cleveland, Ohio, U.S.A.
You can look inside an Apollo Command Module capsule of the Skylab 3 that really allowed astronauts to return to Earth in 1973. Learn how astronauts live in space aboard the International Space Station and how NASA prepares future missions beyond Earth’s orbit. 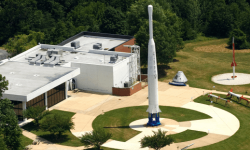 How to go to the NASA Glenn Visitor Center ?